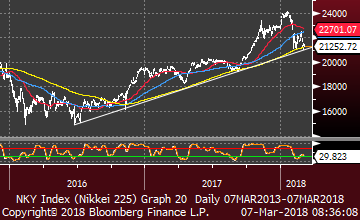 I want to point out what feels like light desperation out of Japan last night and a potential corollary risk to U.S. stocks. The Nikkei is over there (chart right) sitting on its 200dma support while the Bank of Japan owns all the ETFs listed in Tokyo. USDJPY (chart 2) is bottom feeding just above ¥105.00. They can’t stop the yen strength and stock weakness if they try. Last night Masazumi Wakatabe was on the tape saying the BOJ can use current tools for extra easing. BOJ Deputy Governor nominee Masayoshi Amamiya said the Bank of Japan will continue easing until 2% inflation is stable or the “inflation” crowd morale dramatically improves. It feels like markets in motion will remain in motion unless the outside force trying to stop them completely fails. 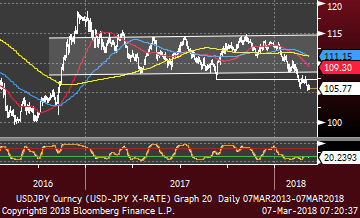 USDJPY and the Nikkei look like they are in major technical danger of trading much lower before the week is over.